We've been dealing with drought for so many years now that I'm surprised every time it rains. For the first time in years it'll start raining in the morning and just keep raining all day long. And then rain again in the next day or two. We even have puddles that last more than an hour! To be honest I'd even forgotten how grass grows. Last year when we grazed a pasture or cut it for hay it remained short for months, in some cases for the whole season. Now when I walk by a paddock the animals have grazed recently expecting it to still look munched-on I discover a field of forage that looks as if it had never been eaten. 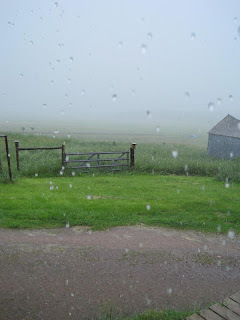 If this rain keeps up I may even stop being surprised when the grass grows back.